How to: Make a 6" card base from light yellow cardstock. Cut a 6" square of colorful circles patterned paper (all of the supplies are from the last Dear Lizzy line), and cut and fold it into a pinwheel. 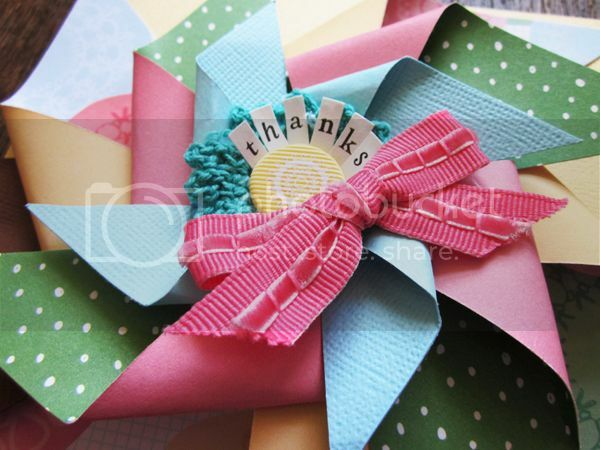 Cut a 4" square from green polka dot paper and cut and fold it into a pinwheel. 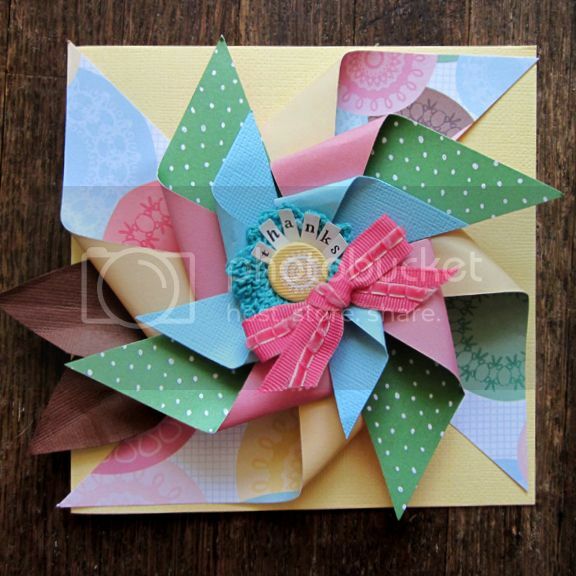 Cut a 3" square from blue cardstock and cut and fold it into a pinwheel. Layer all the pinwheels in a staggered formation and attach them with a fabric brad set through a crocheted flower; adhere to the card base. Cut out two leaves from brown cardstock, crinkle them for dimension, then tuck them under the left side of the pinwheels. Tie pink ribbon into a bow and set it near the brad. Add letter stickers around the brad to make a sentiment. Wow! I've never seen a pinwheel like that. Gorgeous! Awesome! Does it really spin?